Curved diamond cut stainless steel body tray. Stainless steel body tray. Curved diamond cut with drainage point and cap.Perfectly adapted for body preparation. Pole Stretcher is designed for transferring patients with no spinal injury. Produced from materials that resist blood and liquids. Overall size : 2130L x 560W x 150H mm. •M.S.Pole folding lengthwise as well as width wise. •Finish : Pretreated and Epoxy powder coated. •Also available in aluminium. Overall size 2100L x 530W x 120H mm. Folded size: 61OL x 300W x 120H mm. Aluminium folding lengthwise as well as width wise. 4 Fold, provided with bag. Load Bearing capacity 159 Kgs. Stretcher Model BAR022 has foldable in two, in width ways. Stretcher as BAR 021 without NCF SYSTEM joint. Foldable in two , without the ncf system open cm 203x50x14 closed cm 203x15x17. A stretcher, or litter is designed to transport ill or injured persons in a supine or seated position. These devices are used for patient transport in hospitals. They also are employed by emergency and rescue personnel at the scene of an accident. 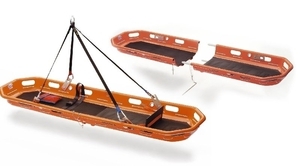 Specialized versions include pediatric and veterinary stretchers, as well as sled, basket and non-magnetic models. Some stretchers are carried by hand, while others are mounted on a wheeled chassis to facilitate the transport of the ill or injured person. Most have straps to immobilize the limbs or head of the patient. Certain models fold or stack to reduce needed storage space. Choice will be influenced by whether the stretcher is intended for indoor or outdoor use, available storage space and similar practical considerations.